Today was absolutely gorgeous. For a day that was supposed to be completely overcast, mother nature had the last laugh and the sun peeked out and gave us a gorgeous blue sky, and what do you do with a gorgeous DC Metro day in early April? Cherry blossoms. Yep, that's correct. 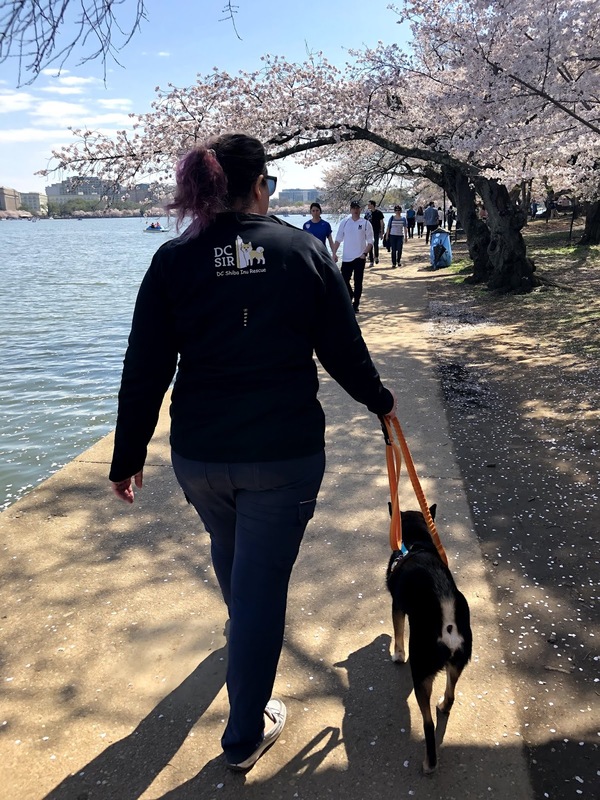 You pull on your tourist shoes and pack up one of the dogs and take them on a walk around the tidal basin. Lady has had the last couple of solo outings to a beach when we were down in Florida. So it was Nymeria's turn. And what a turn it was. Nym absolutely loves to meet people and she met quite a few today and allowed them to bask in her glory. And with a jaunty smile on her face, she was looking quite pettable. And she allowed a few of them to give her pets under her chin and on her back. I've also realized as part of this challenge, that I can share my best of the best smoothie concoctions with you so that you anyone else looking for some tasty recipes packed with plants can reap the benefits of my trials and learn from the mistakes I made. Here are the top 3 smoothie recipes for the past two weeks! Oh! And unless noted assume all of the veggies/fruits are frozen. This first smoothie recipe is in the works, but still pretty delectable as is. It was my first go at trying Aronia Berries (aka Chokeberries). I wanted to start small because with a name like Chokeberries I was a bit apprehensive. But there were no issues and it was absolutely delicious. The bit that's in the works on it in particular is I'm wondering what it would taste like with coffee or green tea instead of the cashew milk and maybe a teaspoon of cocoa powder or cocoa nibs. I'll more than likely try that down the road, but this is a good start. For this next smoothie, the main goal was to get in yellow squash and start trialing other liquids aside from kefir. And it was a smashing success. This is a very filling smoothie that is definitely a meal replacement. With the other smoothies I've made so far, I've been eating carrots, nuts, grapes, cheese or the like on the side to really round out what I'm eating. But Feeling Full is a great option for something to blend together before you head out the door for work. As for the flavor, it leans more into the sweet, robust, and nutty profile. It would be a great starter smoothie for someone trying to add in a variety of plants into your diet because it has nuts, veggies, and fruits. And for the final recipe, this was the smoothie recipe that I started with. The first recipe that I pulled together over a year ago to start to sneak greens into my diet. I knew I liked the berries mixed together and that they would provide a pretty sweet flavor to mask veggies. It's also one of the easiest to source, because all of the plants are readily available in the frozen foods section. The important part of this recipe that might be hard to find is the Elmhurst Milked Cashews. This specific cashew milk is important in this starter recipe because they have more cashews per ounce in their milk than others. So the flavor of the cashew milk helps to mask the spinach further. You can pick another one, but if it's the first time you're trying to trick yourself into eating spinach. I recommend this specific brand. Well, the first one I would like to point out is that cranberries need to be balanced with sweeter than usual fruits. At least the most recent bag of cranberries I got did. I've used cranberries before in smoothies, but something about this mixture was off. I don't know if it was because I wasn't using Elmhurst Milked Cashews or what, but this recipe below was so tart, I felt like my face was going to be frozen into a pucker. That said. The overall flavor wasn't bad. It was just way too friggin' tart for casual drinking. Would probably be great if you’re looking for something to kick in the ol’ saliva glands/lymph nodes around the neck. Here's the recipe. And the other mistake I made was using roasted seeds instead of raw seeds. I picked up a container of Planter's roasted sunflower kernels for something new this past week, because I used to love gnawing on sunflower seeds back when I used to play softball, and I thought it would be a great way to add in a new plant. And it would have been great except for the fact that I didn't think about the roasted flavor profile with the sweetness of all the fruits. This smoothie was so bad that I couldn't finish it and actual threw half of it away. However, I've learned my lesson and will get som raw sunflower kernels to try next time. I struggled with how to start this blog. It's been a hot minute. But I need some accountability for my little project. Last year, I turned 30. I called it my "purdy thirdy," and I gave myself the goal of creating an actual skincare regime and getting back in touch with my artistic side specifically in regards to makeup. 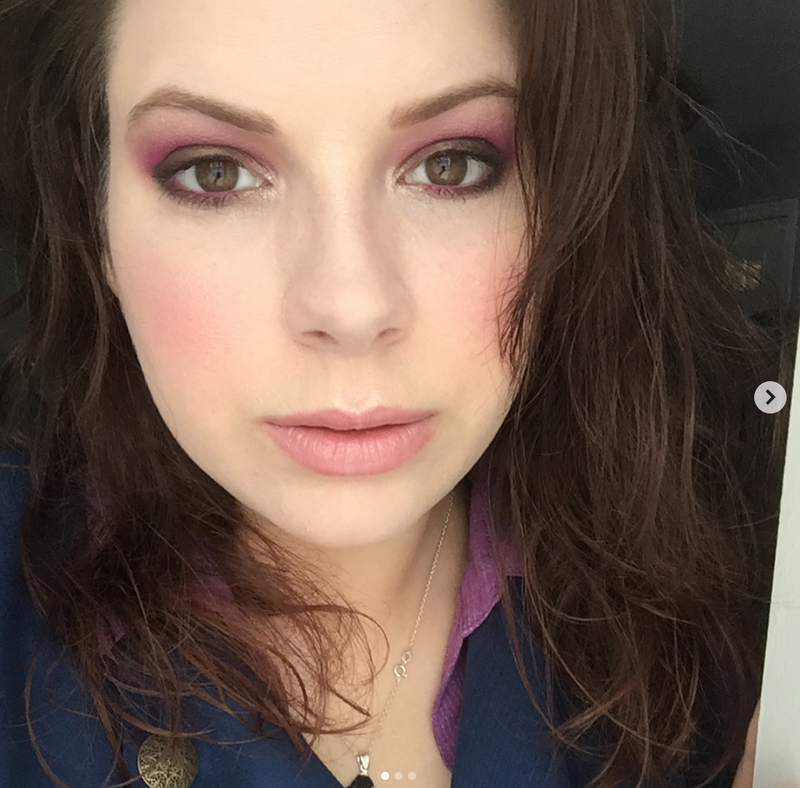 Before 30, my eye-dea of makeup was a Mally Evercolor Shadow stick, some powder foundation, a coat of mascara and bit of blush before I ran out the door. And a skincare regimen was... wash my face if it looked dirty. Did I mention that mascara was waterproof? Oof. I had a lot to learn. So I did. I now have a multi-step skincare regimin that has virtually eliminated my years of acne. But that's just the outside package on these old bags of bones. And I'm not quite too certain about that blush with that eye look, but that's neither here nor there. This year, the 31st year of my life on this planet, I am going to work on my insides. I'm what is commonly called a supertaster. Which is not as super as it may sound. It means that I can taste things that 75% of the population cannot. And it means that some foods taste particularly nasty - specifically the bane of my tongue's existence is plants. Imagine the bitterest thing you've ever eaten... now multiply that by 10. That's what eating arugula tastes like to me. How people can eat an entire arugula salad is beyond me. I taste it and immediately want to upchuck the last week of food. On a lesser level that's what most green things taste like to me and in general most fruits by themselves. It's not that I'm being picky. It's that what a lot of people stick on a healthy plate of food to me physically makes me want to spit it back at whoever put it there. It means I have a hard time with salads and "healthy" foods. Because if I had to eat that. I wouldn't eat. So this year, I am on a campaign to get more plant (blech) foods into me by doing it in a way that I can actually stomach it. Last year, we got a Vitamix. I wanted to try to make my own smoothies without all the ice cream and sherbert a lot of the other places put in them. And I've gotten pretty damn good at making them not taste like pig vomit. I have them multiple times a week, and it's given me a way to trick myself into eating things, I normally wouldn't eat. You can ask my mother. She's been trying to get me to eat healthy for years. Yeah, a lot of people look at the things on that list and think I'm crazy for not liking them. But I don't. I sit there and eat them and cringe. I once had to eat green beans in college because it was a pot luck with two people... me and my friend, and the other person only made green beans... and it was the longest hour of my life. I'd eat a green bean, gag, shove something else into my mouth, green bean, gag,... you get the picture. But I have discovered that with a few minutes tumbling around in a Vitamix, I will willingly consume just about anything if I can add a bit of Elmhurst Cashew Milk in with it too. Over the past year, I've also learned more about the microbiome and how what I eat affects all the lovely bacteria in my gut. Why? 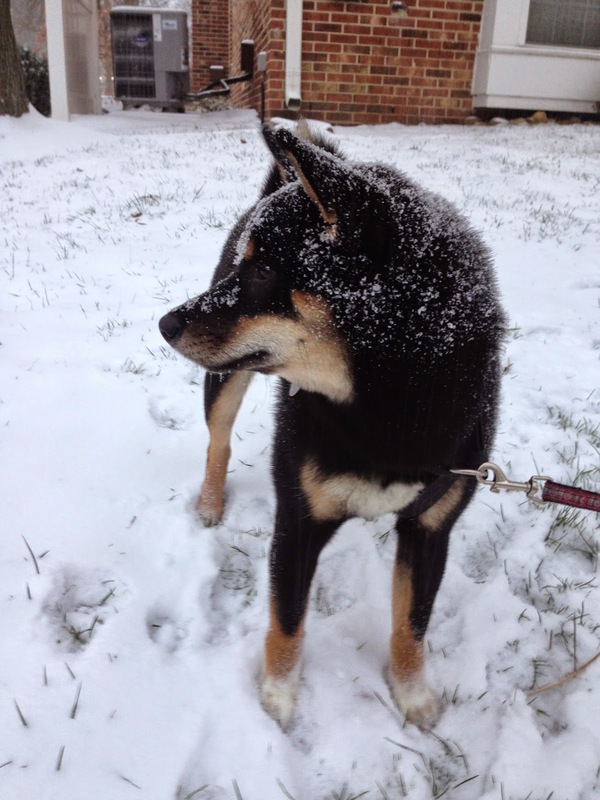 Because the DC Shiba Inu Rescue, of course. It was when I realized that my dogs got more plant diversity than I did that I needed to make a change. 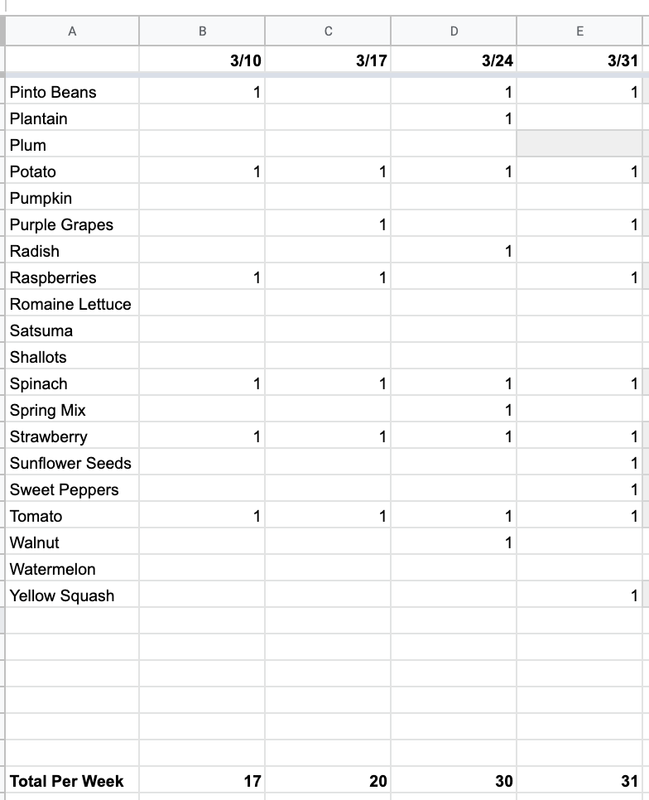 Over the next year, I am going to strive to eat 30 plants every week. I've picked that number because that is what research says is the biggest indicator of a healthy gut. Didn't matter if you were a vegan, vegetarian, omnivore, pescatarian, flexitarian, etc... if you ate 30 DIFFERENT plants every week. Your gut microbiome was healthier than those that did not. Yep. I'm not going on this 30 plants in a week thing to slim down and lose a couple of dress sizes. I'm doing it because I would like to not get sick when someone just breathes on me. I want to diversify my microbiome to improve my immune system. Really, it's very selfish. Improving my health to look slim and pretty doesn't really benefit me. It benefits the people looking at me. And as we've already seen in the picture above. I'm gorgeous (why yes I do have a ridiculously high opinion of myself, thanks for noticing!). 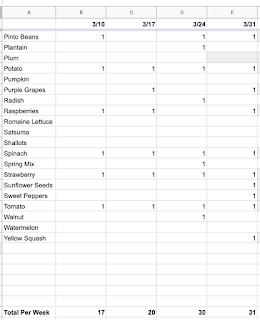 I probably could do 31 plants in a week in honor of my 31st year on planet Earth, but I need to keep my goal number as low as possible, because I've been trying this for two weeks, and I've only gotten up to 17 plants each time. I'm going to keep track of it in this handy-dandy spreadsheet that I made for myself. And my goal is to get closer and closer to that 30 plants number every week. It's aspirational. I might not make it. Some weeks I sure as hell won't make it. But the closer I can get to that goal number, the healthier my gut will be and the less likely I will be to catch your damn colds. STOP SNEEZING ON ME PEOPLE! I HAVE AN AUTOIMMUNE DISORDER! And no, I will not be counting the varieties of fillings in my Pop Tarts as plants... as much as I would like to because that would knock off 5 plants right there every week. But seriously. More plants into me to make my gut healthy, got it? Unless anyone would like to apply for an FMT... Anyone? Actually, just to clarify, that was a no even if someone said yes. I'm so tired of seeing people who are self-proclaimed Christians on Facebook who go to church every Sunday being horribly hypocritical over the Cheeto's executive order from Friday. I know y'all were raised better, and for the older adults in the crowd - I know you TAUGHT ME BETTER. I read the book and drank the Kool-aid. Don't you remember the story of Jesus and the leper? Or how about Leviticus 19:33-34? Nope - hmm... y'all all seem to forget about all those stories of the trinity helping the lowest common denominator when they're not convenient to your narrow-minded view of the world. But you sit there in your pew every Sunday feeling justified in your crooked sense of righteousness, thinking, "I'm a Christian. I go to church." No. You're a Hypocrite who sits in a pew. God seems to only be good enough for you when his message lines up with your strict interpretation of the book. I know I'm not perfect, nor do I claim to be, but I am more than happy to mute you and your hypocritical messages of happiness and joy over rejecting refugees. If you're a Christian drinking the Kool-aid, then it's time for you to remember something. Jesus died for ALL of our sins - ALL OF THEM. Not just for you and your family and your friends - FOR EVERYONE'S. Because God loves EVERYONE. He loves all of his little children - even if they don't follow his religion. God is not someone you can call on for individualistic prayers that are convenient solely for you, when you are not willing to help those suffering in the world. Why? Because GOD LOVES. He LOVES. All I'm seeing from a lot of self-proclaimed Christians are messages of HATE. Does that make you feel proud of yourselves? Proud that you're feeding into the hate in the world. Don't like what I have to say, then fine. Unfriend me. You clearly aren't someone I'd want to be friends with anyway. My friends don't turn their back on people who need help regardless of creed, color, orientation, religion or country of origin. If you aren't willing to stand up for what is right, decent, and kind, then how do you look yourself in the mirror every morning and still call yourself a Christian. If you don't like my fact-bomb and feel the urge to set me straight, then your negative responses to this message will be deleted, and you will be blocked, because this is not a debate. It is a fact-bomb. I don't know why, but I love perfume. It wasn't something that I really ever played with as a child or really had someone in my family that pushed me to like it like I do. My mother never wore perfumes so I wasn't really accustomed to it as a kid. I didn't fully start to embrace it until probably college or maybe my senior year of high school. 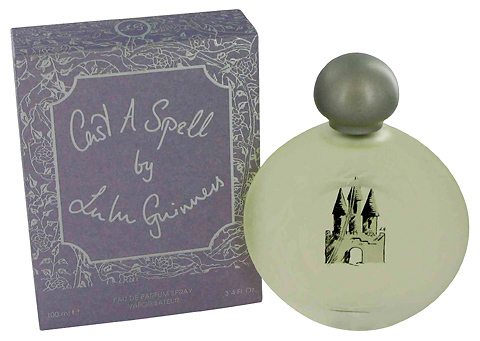 I remember my first signature scent quite well, Cast a Spell by Lulu Guinness. I don't however remember where I bought it. As I started to run down the bottle and the last drops clung to the sides of its frosted container, I panicked, because my signature scent was gone. This was before Amazon or online shopping really took off. If I couldn't remember where I had gotten it... I wasn't going to be able to re buy it. The smell of Cast a Spell was a complex vanilla that hinted at something a little spicy. I loved it. It could be worn everyday and it was just complex enough that it carried over to evening events very nicely. The other problem in trying to hunt down another bottle of Cast a Spell was that I couldn't even remember the name. The bottle doesn't say it, and the box had been thrown out long ago. So instead of panicking that my signature scent was gone, I headed off to Sephora to find something that reminded me of that smell. So started my hunt for my next signature scent. What I found was Saint by Kat Von D.
Saint is a lovely little perfume that held me over through my last few years of college and into my post-college years quite nicely. 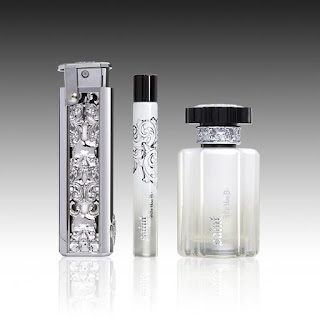 It's a very day friendly scent that wears lightly on the skin and slowly fades over the day, which is why I would always stick the rollerball in my purse to reapply later in the day. But what it lacked that Cast a Spell had was that spicy complexity that allowed it to carry over into night settings. This left me wanting something else for those special nights out. This is when my love of perfume really took off. Because unlike the days when Cast a Spell was the only perfume I needed, now I needed more - I needed scents for different days, different events and different moods. Where Cast a Spell carried me day in and day out, Saint, while a great scent that I still wear to this day didn't have the complexity that really made me want to wear it over and over again. Since then, I have found another bottle of Cast a Spell, but I've also been driven by this need to find a great date night scent - this was even more apparent when hunting for the perfect wedding scent (yes, I needed a special smell for the day of - Killer Queen by Katy Perry just incase you were wondering). It had become a bit out of control, so instead of buying new ones, I found a couple of Scent subscription boxes. Looking for your signature scent, but don't want to commit to a full bottle, check out two subscription scent boxes that I'm gaga over: Scentbird and Scent Trunk. Scentbird is very enticing - the perfumes are all major market perfumes that you can purchase individually or schedule out for your subscription deliveries. I've been using this one for a few months, and I like that I'm able to try scents for 30 days without commitment. You get one perfume from your list per month that you pick based on your scent favorites. Scent Trunk works a bit differently, but has it's own benefits. Scent Trunk highlights small batch artizan perfumers, who are not mass market perfumers. These scents are going to be pretty unique to your friend set so it's likely no one will ever be wearing the same scent you are. Their perfumes come in smaller vial sizes, but you get three to the subscription - so you can try out different scents each month based on your scent preferences. This one you don't get to pick the scents, which is a bit of a bummer, but I do like the tailored grab bag mentality. The weather hit 50 degrees today in the DC Metro, and it felt so much like spring that I could hardly believe my luck. I love spring, to me it means gardening, parks, walking my dog leisurely, happy birds, and adoption events! Something that I've noticed in the DC area is the prominence of rescues at almost every pet store in the area, from the period of March through August. Sitting out front with their wide-eyed-dogs looking ardently for their forever homes. SO I know this isn't just limited to puppies, but actually all dogs out there in the DC Metro area that need a loving home. I've taken the liberty of compiling an exhaustive list of all the rescues, shelters, & welfare leagues in the DC Metro area (if I've forgotten/missed one - let me know). So as you begin thinking about having a forever furry friend join you for the first (or maybe second time) this spring - consider giving the below a look, if you think dog adoption is the thing for you. I have to admit though, some of the adoption application processes are quite vigorous - you can't walk into the majority of these places and expect to have a pet the same day. So do your research and choose wisely, because aside from the DC Shiba Inu Rescue, I know 0 things about any of the ones below, and I cannot vouch nor do I represent them. So essentially - Looking for a Dog in the Northern Virginia, Southern Maryland, or Washington, DC Area? The below rescues/shelters/welfare leagues are within a relatively close driving distance, and are looking for high quality adopters! If you know that one of these rescues or shelters not on this list or that are on this list and no longer operating - let me know! With the frost in the air getting more and more bitter, I can't help but dream of warmer days. The smell of marigolds, while I flip through a Southern Living Magazine with a sweet tea in hand - sunning on the porch. It's enough to make me start thinking about my plants and my garden and my seedlings. Last year, I purchased a grow light, which was just the bees absolute knees in terms of prepping seedlings for spring planting, but after a particularly viscous set of aphids, all my seedlings were destroyed and with it my hopes of a magnificent harvest. So I recouped what I could and struggled along the rest of the summer with an eggplant (destroyed by a hornworm), 2 pepper plants (produced until the first frost), and a pineberry plant (my pride and joy). When the chills of fall set in I pulled my pineberry plant and the runners I had cultivated indoors with me, but a long thanksgiving break killed one of the runners, and little Nymeria did in the rest. 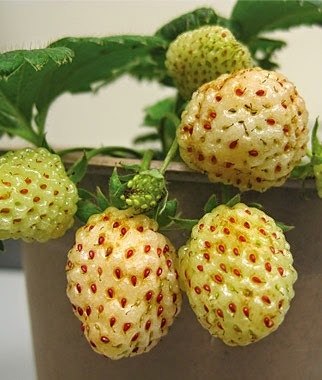 So I'm back to my sole pineberry plant hoping fervently for some warmer weather. I've decided that I'm going to stick with what I know and what I can eat. I want to limit myself to the bare necessities, because we might be moving places in the middle of the summer and it would be a beast to have to move 20 containers. I want my garden to have some focus, and I want my garden to not die, like it did this past summer (which might have been my fault - planning a wedding and all that jazz). So I'm going to limit my plants. I'm thinking that I should pick up some pineberry seeds and start from seeds, to see how that goes, and add to my one prize, lonely plant. I always love a challenge. 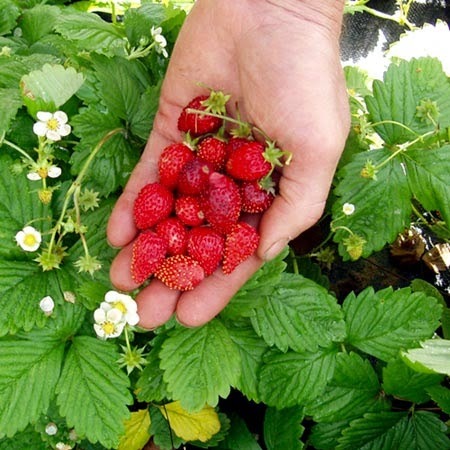 I'm also thinking about branching out into another kind of strawberry - I think the alpines all have a nice small size to them, and one I found doesn't have runners - so that would keep it all in it's container. I also like having scallions and chives about - they have such a distinctive smell, and my chives grow quite prolifically. 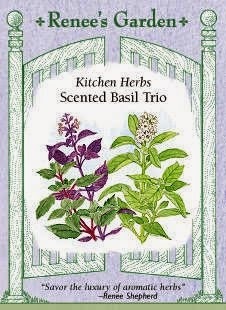 I think I'll bring back some basil. It's always so expensive to get fresh basil at the store, and I do so long for some fresh pesto. Aside from that... I still have some garlic in the ground, trying to get it to winter properly so that it grows me some big, honking bulbs, but if that fails - I think I'll wait till next summer (2016) to try again. It's going to be small, but I hope it's at least fruitful. Take my advice, if you're ever in Scotland... see some friggin' castles. See the friggin' history - it's got a good 2+ millennia of history on the United States, and the lore and the culture and the people just beg to be seen and told. So, with that said, if you're traveling to Scotland to see the historic sites, then I highly, HIGHLY recommend that you get the Explorer Pass. Seriously, If you plan on visiting more than two castles in a short-time frame, it's worth it. The $$ to get into the various castles ranges, based on popularity and location, and to be perfectly honest the length of the lines to get in at some of the more popular castles is completely unreal. a lot of buying things, as you could imagine. I also recommend that you do NOT get it at Stirling or Edinburgh Castles. 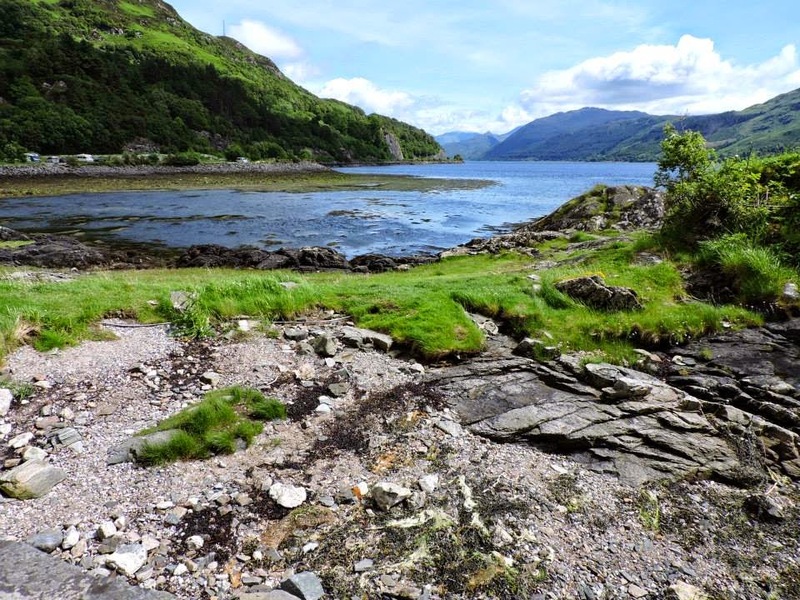 These are two of the top tourist destinations in the Highlands and as such, they have the longest lines. If you get your Explorer Pass at a less popular destination then you get fast-tracked at the other two, which means you get to waltz past the people who did not get this tip and do not have to waste countless minutes or hours, depending on how busy they are that day, in line just to get past the gate. 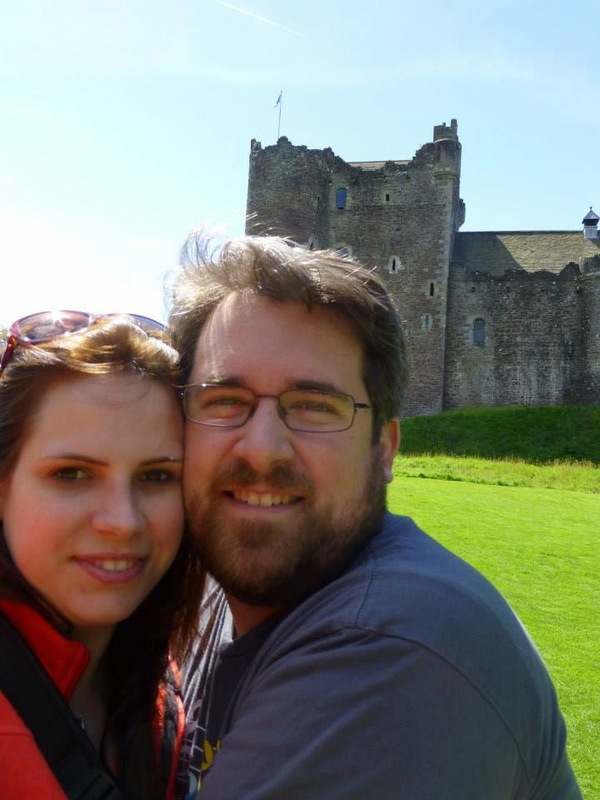 JR and I did not set out to Scotland to see castles, we just set out with the hopes of letting our feet guide us, but we wound up seeing quite a few in the 6 days we spent galavanting across the highlands. We saw privately owned castles, as well as nationally owned castles, and while the privately owned had a stronger feel of charm and homeliness (since some are still used as a home), the nationally owned ones were quite awesome for the history they told and the views. Seriously, the views were amazing. 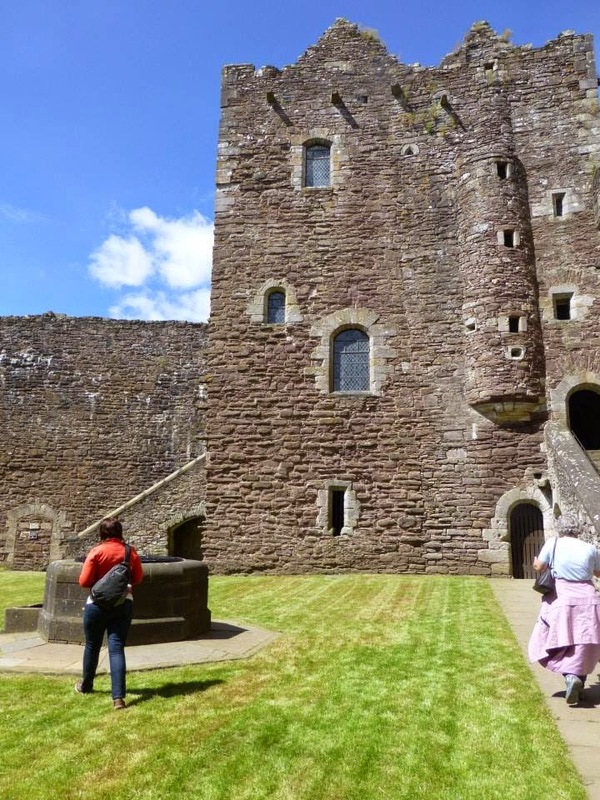 Standing outside Doune Castle, which is where parts of Outlander, Game of Thrones, and the Classic Monty Python Movie that involves the Holy Grail. 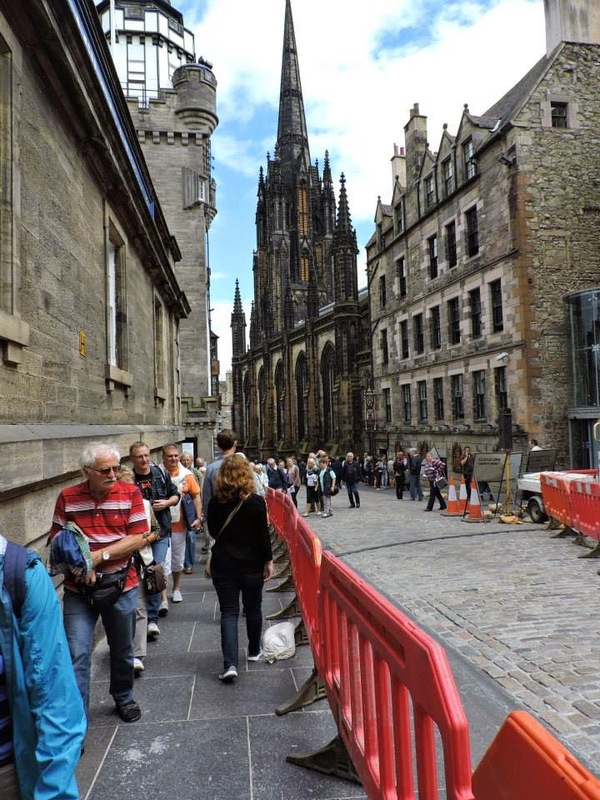 Anywho, the Explorer Pass is not universal - not all castles we went to would accept it, but you know that going in - you can see the full list of historic sites that the pass allows you to see here and they even have a mobile app - HOW FRIGGIN' HANDY IS THAT? Basically the most friggin' handiest, that's how handy. The Scots are always using their thinkers that's for sure! and that well is definitely in a few Outlander scenes. Don't be like us - get the Explorer Pass, and explore to your heart's content. Because who doesn't hate paying for something twice, when they could have just paid for it once, all at the same time... and just flashed a book to go through the lines without a fuss.... no one. That's who! Happy Travels, and bring me back some clotted cream and scones!